This post has been sponsored by Stanley Steemer, all thoughts and opinions are my own. You live in your house, so it’s no surprise it gets dirty! 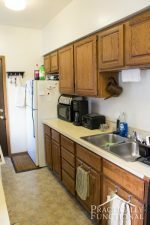 The kitchen tends to get the dirtiest because it’s where we spend most of our time. Our kitchen is covered in muddy paw prints, juice spills, and dirty shoe prints pretty much every day; that’s just life! 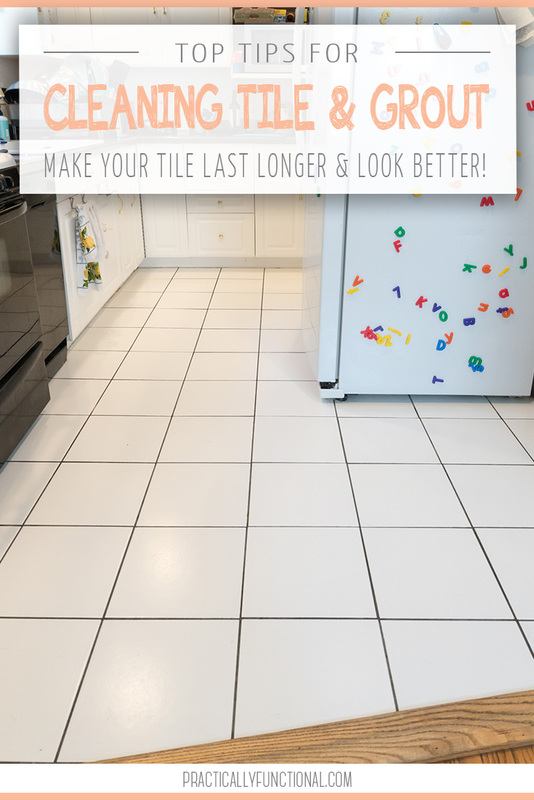 But there are a few simple things you can do to keep your tile and grout clean so they last a long time. 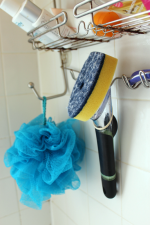 Here are my top tips for cleaning tile and grout in your home. 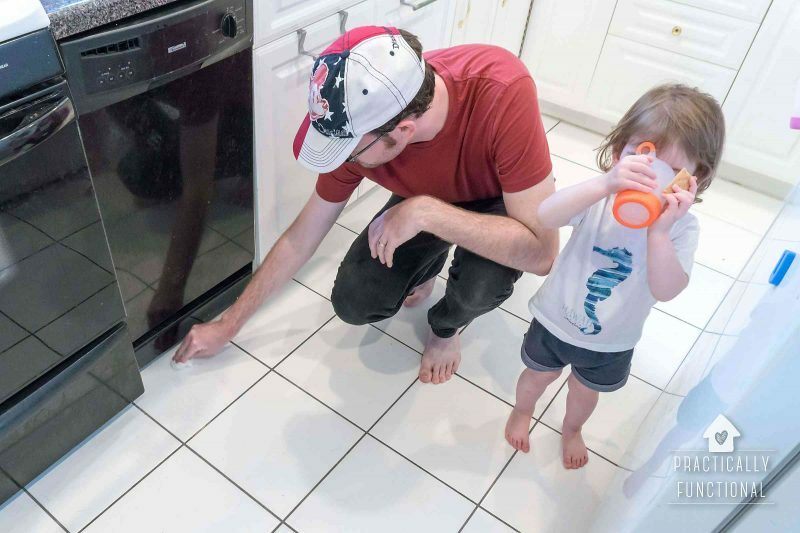 Even if you just spill a little water on the floor or drop an ice cube, that water can attract dirt and then soak into your floor, so always dry up water as soon as possible. This goes for when you finish mopping as well! Once you’ve rinsed away any cleaner residue, dry your floors so they don’t attract more dirt. 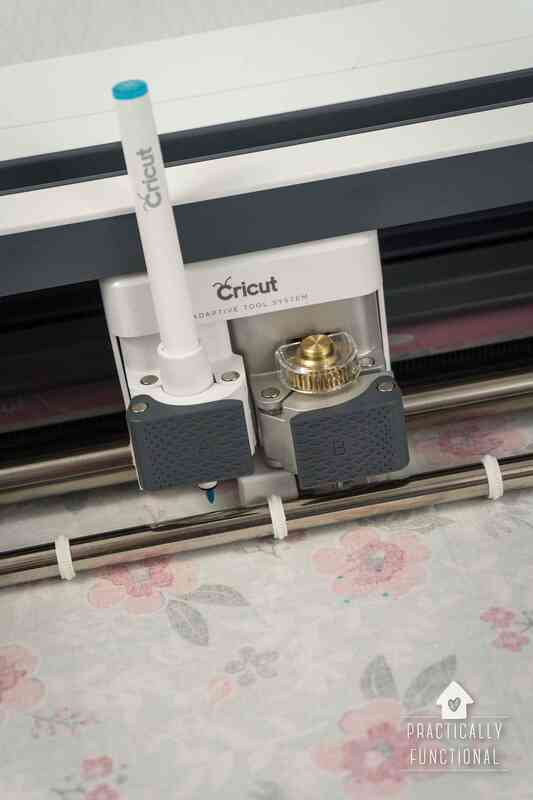 Mats or rugs can help prevent wear and tear on your floors from foot traffic. If you have tile in your entryway, add a small rug to protect the tile just inside the door. 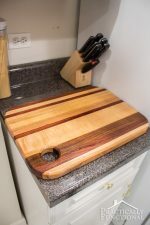 You can also add a mat or rug in the kitchen in front of the sink to help keep splashes from soaking into your tile. A vacuum is the best way to remove loose dirt and dust from your tile floors. Vacuuming regularly can help keep get rid of dirt before it’s “ground” into your floors by people walking on them. Plus, if you have pets, you probably know that pet hair just sort of floats around on hard surfaces, so a regular vacuuming will help keep those pet hair tumbleweeds at bay! The best way to get your tile and grout clean is to have a professional do it! They have the tools to get out dirt and grime that you never could with a mop or a broom. We had Stanley Steemer come clean the tile in our kitchen floor, and I’m totally thrilled! It was super easy to schedule the appointment online, plus they’re open on Saturdays, which is great if you’re busy during the week. They arrived on time and got right to work, and now our floors are sparkling clean! 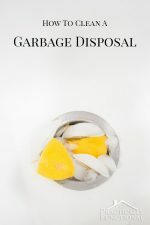 They use a multi-step process to make sure everything gets totally clean. They started by spraying a cleaning solution on the floor and scrubbing the grout lines in between every tile with a stiff bristle brush. Then came the hot water extraction cleaning process. 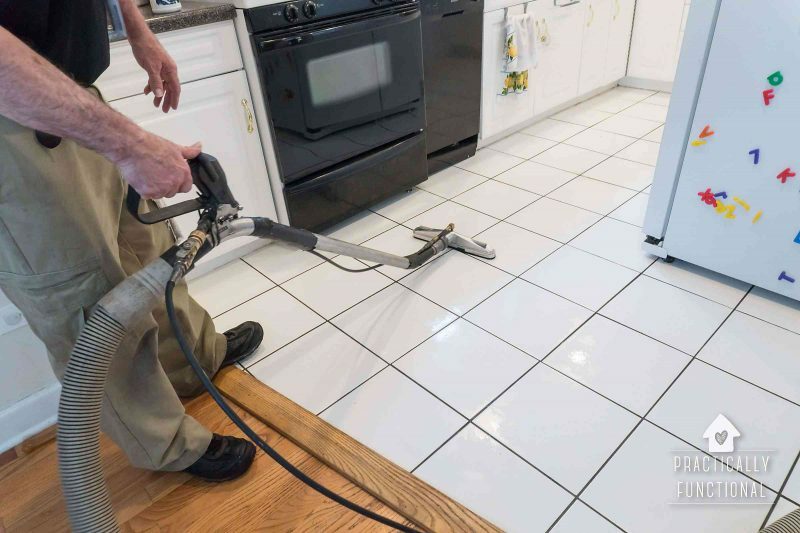 They used their proprietary, state-of-the-art, truck-mounted washer to clean the tile by pressure washing it with hot water, then using powerful suction to remove the dirt and grime from the tile. The washer even gets the dirt that hides deep within the pores of the grout lines. 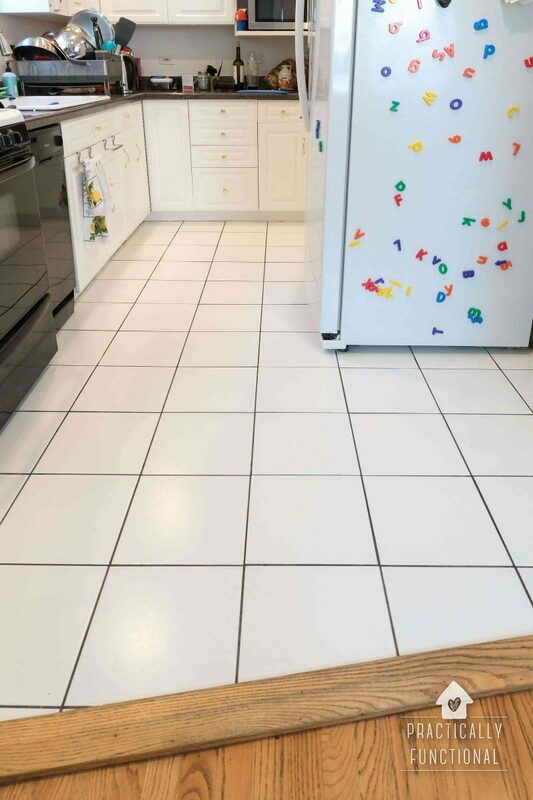 That washer is super powerful; there’s no way I could even come close to getting the tile and grout this clean, even if I got down on the floor and scrubbed the heck out of it with a floor cleaner! The best part is, the entire system mounted in their van, so all that dirty water goes right out the front door and into a tank in the van, meaning we don’t have to deal with it in the house! Also, I can breathe a bit easier knowing that Stanley Steemer is Certified Asthma & Allergy Friendly™ not only for their carpet cleaning, but also for their tile and grout cleaning and hardwood floor cleaning too! That’s right…allergens can get trapped in your tile and grout too. So especially if you suffer from allergies, make sure to have your tile professionally cleaned to get rid of those allergens. 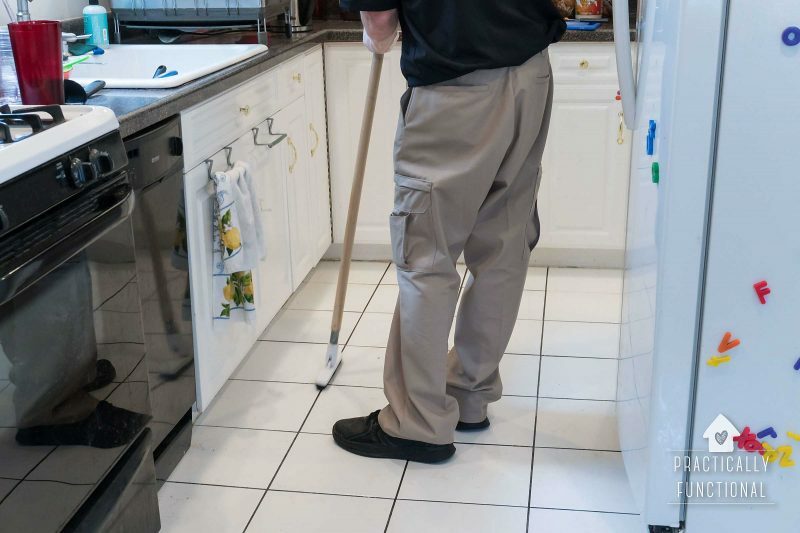 The last step in the Stanley Steemer cleaning process is to seal your newly cleaned grout. Grout is porous, which means it will absorb dirt and spills. But a good grout sealant can prevent that! A grout sealer forms a protective barrier on top of your grout to keep it from absorbing liquids and becoming discolored. They applied a clear sealant to our grout, but they have a color sealant option as well. The colored sealant is great if you already have permanent discoloration on your grout lines; it will give your grout a uniform color once again and hide the discoloration. 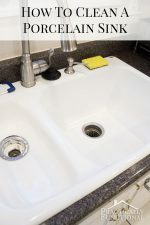 It’s a good idea to have your grout resealed every couple of years, or possibly even more often for wet areas like showers and sink backsplashes. You can check to see if your grout needs to be sealed by dropping a small bit of water on the grout. If it beads up and sits on the surface, your grout sealant is still doing its job! If it soaks into the grout, it’s probably time to seal the grout again. When you finish mopping, always rinse your tile with clean water to remove any cleaner residue. This also goes for spills! After you wipe up a spill, use a damp rag to wipe the area again, just to make sure there’s nothing left to soak into your tile. 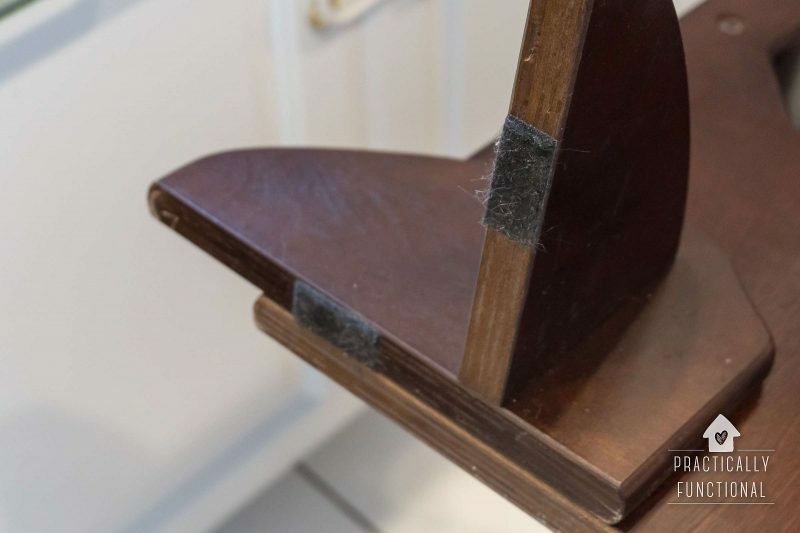 Heavy furniture can scratch the surface of your tile, leaving places where dirt can get stuck. If you have furniture on your tile floors, add little felt pads to the bottom to help things slide around without scratching your floors. Remember, this is your home; don’t be afraid to live in it, even if it means getting a little messy! 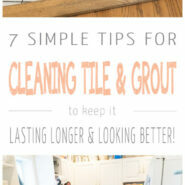 If you follow these simple tips for cleaning tile and grout, your tile floors will look better and last longer. And Stanley Steemer is always there to help you get your floors clean again so you can just focus on living life! Is your home in need of a little summer cleaning? From carpets and tile & grout to air ducts, and more, Stanley Steemer has you covered if you want to freshen up your space! 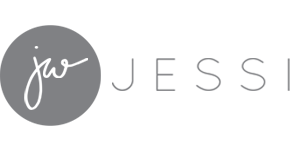 Enter below for your chance to win a $400 Stanley Steemer gift card.